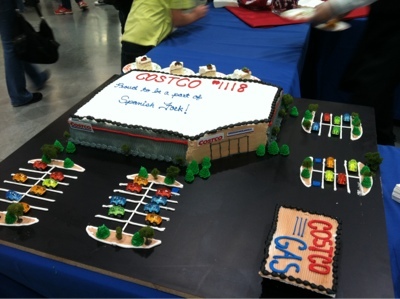 Cake of the Costco! So clever. This week I had an awesome opportunity to work the grand opening. You might not know this (I didn’t) but that night before a Costco opens they put on a huge reception where people can come in a get a sneak peak at the new store – the registers aren't open, so it’s an ultimate window shopping experience. 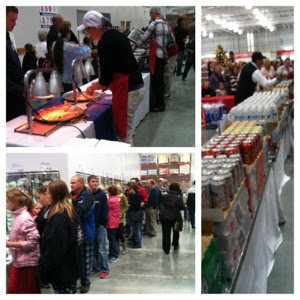 Let me tell you, Costco knows how to throw a party! I was told that they cater with food that you can buy in store…so I’m thinking it’s extravagant samples. No. They fed the whole town, it was amazing to see! They had pizza, drinks, a cheese table, a meet table, fruit, chips with every dip they sell, cake, pie, cheesecake. It was crazy! The lines were enormous! Why was I at this extravaganza? I have an occasional side job with a company called CORA. They work with company’s and get them into Costco to do 10 days shows where their product gets to be in store! It’s an awesome opportunity for these companies, and brings something special to Costco. I work in during the trade show in store to assist in selling the products. My favorite to work is Jennifer Adams Home. 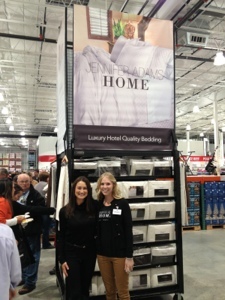 She has high-end hotel quality bedding in Costco’s right now – if you bought them online they’d be $400! But we sell them for just under $100 – and trust me, they’re amazing! Having a dad that worked for Bed Bath and Beyond for years has made me quite the bedding and kitchen gadget snob – and these are the best I've ever seen! Coolest part of the evening? 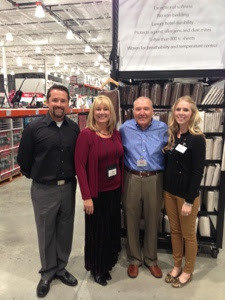 I got to meet the CEO of Costco and Jennifer Adams herself! She’s the up and coming Martha Stewart and she is absolutely lovely – she had on a ring with a rock that was bigger than the width of her finger! And she was rocking the most beautiful Chanel black boots…they were to die for! I am flattered to work this show, apparently they’re picky on who works openings. I guess last time I worked a show my sales were amazing (I had no idea…I should get a bonus!) and someone higher up in CORA had to drop of some extra product (cause of my awesome sales) and she was so impressed by my presence and how I worked with the customers. See…flattered! A lot of CORA and Jennifer Adams people were at the show and they all kept saying “oh, you’re Melissa” or thanking me for looking nice (what do the other reps look like?!?!) and saying they were happy to have the ‘cute’ rep. Ha, ha. I felt a little pressure to live up to the hype I've apparently gotten; wore my hair extensions for a little confidence boost for the night. 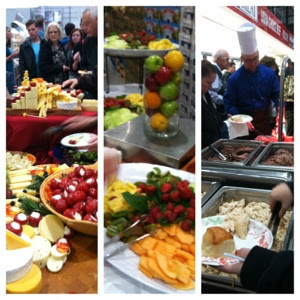 If you find out about a Costco opening near you – go to the reception! It’s quite the experience! Now I want to buy new bedding! And congrats on your awesome sales reputation!